The insurance and reinsurance industry loss from the Tianjin, China port explosions last summer could creed up to somewhere between $5 billion to as much as $6 billion, according to reports, threatening a growing loss exposure for some ILS funds. 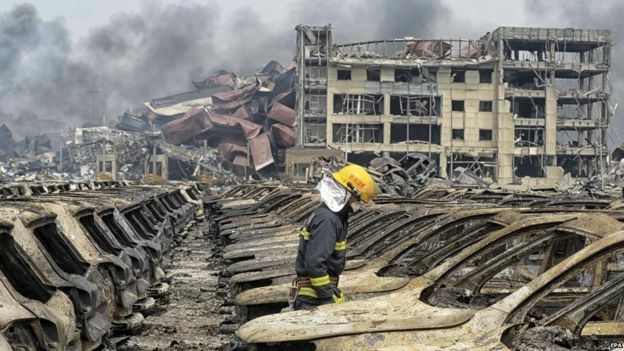 Shortly after the Tianjin blasts occurred, the first insurance industry loss estimates suggested the toll could reach $1.5 billion or higher. Reinsurance broker Guy Carpenter then estimated an industry loss of around $3.3 billion, almost double the initial estimates, with exposures by that time expected to seep into the reinsurance market. Then it became clear that a number of the ILS fund managers that allocate capital to specialty lines, such as marine reinsurance, were potentially exposed, with at least one ILS fund reserving a side pocket due to potential Tianjin exposures. Those potential ILS fund exposures look set to grow and become more likely to cause some form of loss, as the total insurance bill from Tianjin looks set to head north of $5 billion. Speaking at the International Union of Marine Insurance (IUMI) winter conference yesterday, a representative of the organisation said that around 70,000 cars are now expected to have been in the port area at the time of the blasts and that the losses from the explosions are now expected to be much higher than previously thought. According to the Insider, IUMI executive Patrizia Kern-Ferretti said that the insured loss, including clean-up costs, damage to cars and other products stored at the site, is expected to result in a cost to the insurance industry of between $5 billion and $6 billion. With half or more of these claims expected to fall within the marine insurance and reinsurance lines, the Tianjin blasts could be the largest single marine insurance loss in the market’s history. The minimal exposure reported by some ILS funds has likely been estimated at much lower industry loss levels, perhaps $3 billion or less. That means there may be some maths for ILS fund managers with exposed positions to do, in order to work out what this means for their funds and whether they have reserved or side pocketed sufficiently. The exposure for ILS funds to Tianjin will likely still be minimal, given where in the marine reinsurance tower the majority play on a collateralised basis. However there could also be exposure in some reinsurance sidecars, which could lead to diminished returns for 2015. Of course, for any reinsurance sidecar vehicles which have exposure, there is likely an element of collateral being held back for Tianjin. The continued development of the loss could result in this period being extended in some cases. It’s hard to think that major sidecars or quota shares, such as Hannover Re’s K-Cessions, Munich Re’s Eden Re series or Swiss Re’s Sector Re, will not have some exposure to Tianjin loss creep. Still, ILS fund exposure will remain minimal, as the traditional reinsurance market still commands the marine reinsurance and other specialty lines. So in fact the exposure for third-party investors via sidecars actually has the potential to be larger, although again will likely not be meaningful in the grand scheme of sidecar returns and where losses tend to attach to those vehicles. However Tianjin is another good example of the expanding remit of the ILS and capital markets in reinsurance and how that has the potential to bring with it a greater number and variety of losses, from different areas of the market and the world. – Tianjin explosion loss evolving, ILS fund exposures still minimal. – Tianjin blasts insurance loss as much as $3.3bn: Guy Carpenter. – ILS funds report potential exposure to Tianjin blast, but minimal. – Tianjin explosion insurance losses could hit $1.5bn (or higher). – Tianjin explosion costs to hit reinsurers, amount uncertain: Rating agencies.